The journey of Eid-ul-Azha has started with hassles as the trains, buses and launches are delaying to depart the city on Saturday. The city dwellers started departing Dhaka city from yesterday morning to celebrate the Eid with family members and relatives. People, who left Dhaka by Dhaka-Mymensingh Highway on Friday, faced intolerable traffic congestion as RMG workers took to the road in Gazipur demanding wages. On the same route, traffic congestion was seen on Saturday as the traffic management was not smooth in Gazipur Chowrasta area. 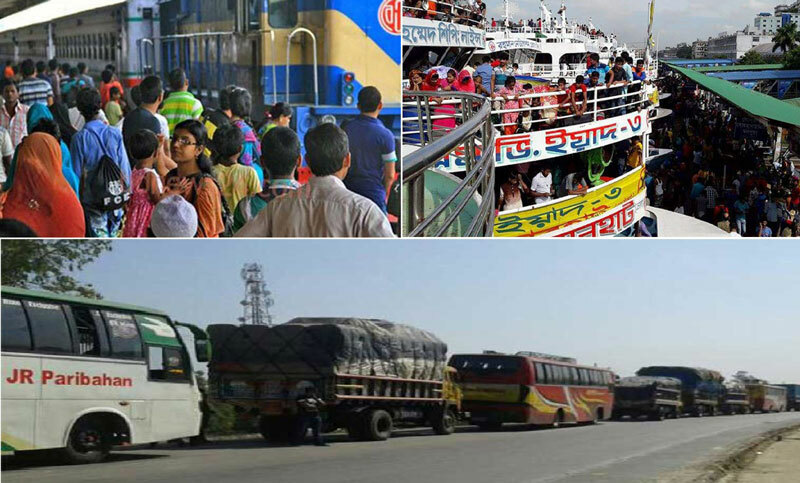 Traffic management on Dhaka-Chittagong, Dhaka-Mymensingh, Dhaka-Aricha and several other routes of the country were seen as very chaotic due to non-disciplined movements of the vehicles, according to our correspondents. Several trains delayed to leave the capital with Eid holidaymakers as the returning trains could not reach the here from respective city timely, according to railway authorities. Most of the trains delayed minimum one hours to leave the capital on Saturday morning, according to News24 TV, a sister concern of Kalerkantho. The crowd of the People, wish to travel to the southern part of the country, were seen from the morning in Sadarghat area. They were seen struggling to get on a water bus or launch to reach their desired destination paying more money than the regular fare.